Beautiful beaches in Bali are not only Kuta Beach. There are still others like the Virgin Beach of Karangasem which also has immeasurable beauty. The beauty of Virgin Beach is still natural so it is appropriate if tourists are interested in coming. Not only the natural nature, the location of Virgin Beach is also hidden flanked by two tall cliffs of Penggiang and Apen. No wonder the tourists who come really enjoy the atmosphere at the Virgin Beach of Karangasem because it feels like on a private beach. Virgin Beach is also not as busy as Kuta Beach. The silence and comfort created here is very suitable as a stress reliever. The natural beauty of Virgin Beach has made this beach one of the best beaches in the world. Even the name is often mentioned in overseas travel guide books. Virgin beach Bali with white sand and fine and clean granules, eventhough the sand is not too wide. Because of the white and clean sand, foreign tourists name the Virgin Beach as the White Sand Beach Bali. 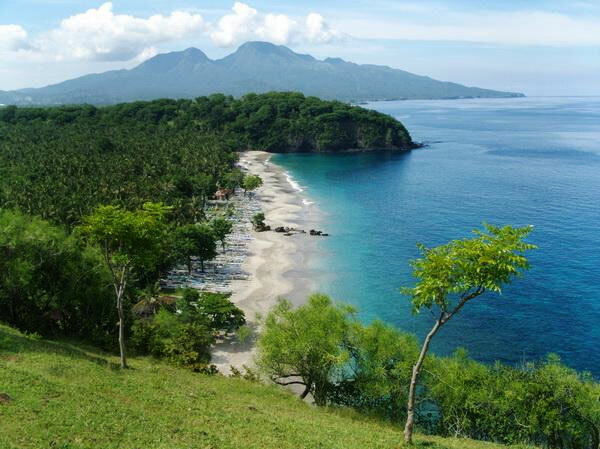 However, the local community even knew Virgin Beach by the name Perasi Karangasem Beach. To reach Virgin Beach it takes at least 2 to 2.5 hours drive from Kuta. Administratively it is in the Perasi Village area, Karangasem District, Karangasem Regency, Bali. Because the location is quite far from Kuta, so there are not too many tourists come. Therefore the natural peace on Virgin Beach is highly coveted by visitors who are looking for silence. Travel to Karangasem Virgin Beach, you can play sand or just sit back on the beach. For children, playing sand here is certainly a fun activity because of the soft grains of sand. For those who want to sunbathe can also be done by renting sun loungers and beach umbrellas provided by small cafes there. The blue sea and the sweeping waves seemed to call you to wet your body by swimming. Even if the weather is very sunny, you can snorkel in the clear sea. The best time to come to Virgin Beach is in the morning or evening. But if you want to enjoy the breeze while relaxing on the beach, you can come in the afternoon. Facilities at Virgin Beach are still very limited, but this is not an obstacle for tourists to visit. These facilities include small cafes, shade umbrellas, and toilets. For accommodation facilities such as lodging is not yet available. But if you intend to spend the night in this area, you can stay in the tourist area of ​​Candidasa.